We at Great Commission Bible College are continually looking for ways to improve learning for our students around the globe. Research has proven that the more ways we interact with the Biblical text (reading, researching, memorizing, and writing out answers), the better we retain the biblical content. Therefore, the Board of Administration of GCBC has decided with the recommendation of our accrediting organization (AICCS) to transition away from electronic grading for all levels in the near future. This will RAISE THE STANDARD and help produce quality disciples who will, in turn, produce quality disciples around the world. This first effects the Certificate of Discipleship, but will take effect for all levels ver soon. It is no accident you have found this website. Many have been praying for the Holy Spirit to guide, so you can discover all the Lord has for you. God has something amazing He is about to reveal to you; HIS WORD and HIS DESTINY for you. Our goal at GCBC is to equip the saints for ministry, through quality, cost-effective, Christ Centered teaching. We desire to impart God's WORD in a new generation in order to raise up a mighty army of men and women who are spiritually, physically and mentally prepared to spread the Gospel of Jesus Christ throughout the world, until He comes. A little history so you can know us better. Many men and women of God from literally around the world have partnered together, using the gifts the Lord has endowed, to advance His mission. Computer programmers and tech specialists have created programs and websites. Gifted authors and writers have developed an amazing curriculum. Professors, skilled wordsmiths, clerical personnel, and administrators have teamed together to create one of a kind learning experience. All Great Commission Bible College courses are FREE, because of generous donors who believe in the vision and sacrificially give of their financial resource. Upon Dr. Ehrlich's retirement, he recommended that Dr. Galen Pearcy succeed him as President, which was unanimously approved by the Board of Administration on September 23, 2017. Enrollment and vision have increased since that time, currently, there are over 8,000 students enrolled in 104 nations covering the globe. Most students study online but we have added an additional 47 Distant Learning Centers, which meet in public buildings and churches in various locations. Our goal is by the time you leave our portals; you will be equipped and ready to take responsibilities in your chosen professions, prepared, proven and ready to take the Great Commission into All the world, wherever the Lord may call. 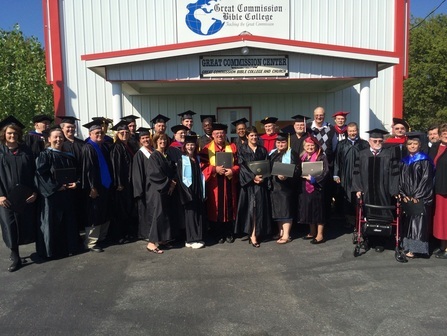 After graduation, many students become GCBC financial donors desiring to bless others as they have been blessed. Some open GCBC Distant Learning Centers in their community and or become GCBC instructors. The flag is shown below the flags of the countries that have visited this site since January 1, 2011. You can view more details by clicking on the flag at the bottom of the chart. You can then print a map showing the countries where the visitation came from.